Text © Copyright October 2018, JThomas; licensed for re-use under a Creative Commons Licence. 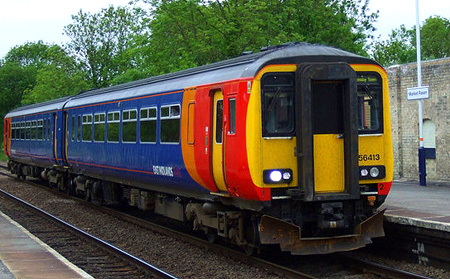 The British Rail Class 156 Sprinter is a class of diesel multiple-unit trains. Each consisting of two carriages, a total of 114 sets were built between 1987 and 1989 at Metro-Cammell's Washwood Heath works. One class of several designed to replace ageing "Heritage" DMU's, these second-generation units were built to then modern standards.